Leonardo Patrial is a Brazilian biologist born in the Brazilian State of Paraná. He enjoys nature since he was a little kid . Nature was always highlighted at home. His first real contacts with wildlife happened while , camping, fishing and zoo visits with his parents, relatives and friends. At the age of seventeen years old he moved to USA where finished the High School in Fort Scott, Kansas as an exchange student. At that time joined the Hunter Education Course offered by the Kansas Wildlife Department. Back in Brazil, in 1999 started to study biology in Curitiba, getting his Bachelor Degree in 2002. During that time he was volunteer guide in the Guartelá State Park l). One year later he finished the specialization course in Conservation Biology and Wildlife Management by PUC-Pr, studding birds of forest patches in a locality of Londrina, where also elaborated and planted more than 5.000 trees to form a ecological corridor and step stones to local birds. In 2007 moved to northeast Brazil, more precisely at the village of Itacaré, State of Bahia. Where, he was attracted by the astonishing nature and high biodiversity of the area. 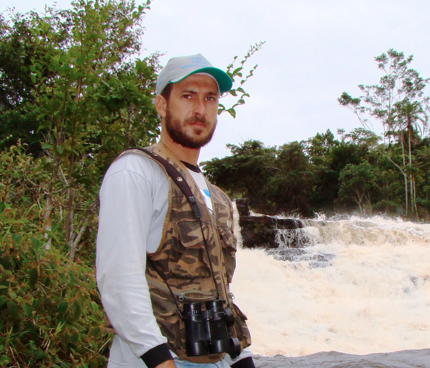 After three years living in Itacaré , he started to guide birdwatchers, photographers, and nature lovers trough out South Bahia, deserving special attention the endemic galore of Boa Nova wet and dry forests, Itacaré lowlands forests, Serra Bonita south Bahia last reminiscent of montane forest and the Chapada Diamantina National Park. Besides, the Brazilian Northeast, Leonardo has also been guiding, in the past years, tours to other parts of Brazil, such the Pantanal, Serra das Araras and Chapada dos Guimaraes National Park, as well, the Atlantic Forest, specially, Ubatuba and Itatiaia National Park.